I don't collect Barbie dolls, so I don't know a whole lot about them. In fact, I never had a single Barbie doll when I was growing up. I think this was because my mom didn't approve of them, skinny waists and all. 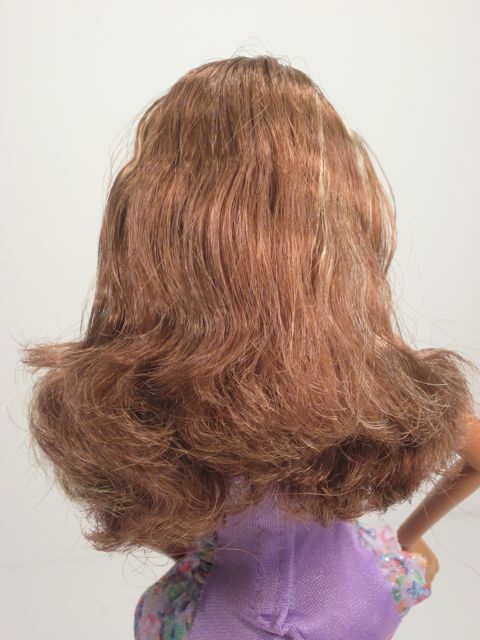 One other possible explanation for my lack of Barbies is that whenever I was given a doll with rooted hair, I would gradually cut off all the hair until it was just a wreckage of uneven spikes (and then I would poke the spikey ends into the head with a pencil). So, yeah. That could be it, too. For one reason or another, I have mostly avoided the Barbie aisle for my entire life. 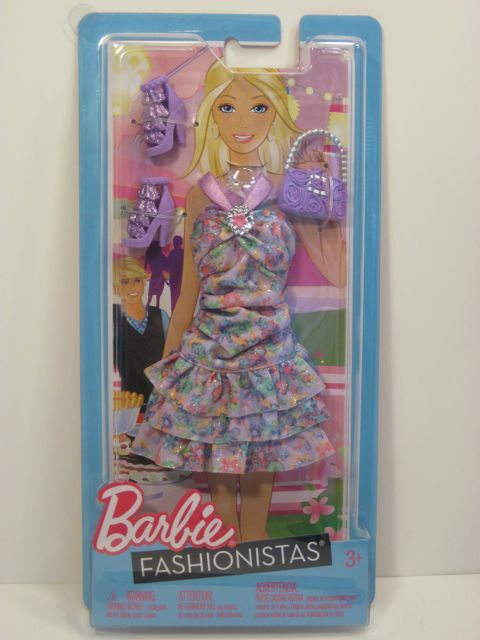 However, when Mattel released the "Fashionista" line and I learned that the dolls have exchangeable heads, I was interested. Actually, on these dolls the whole head and shoulder unit comes off, and you can buy extra head attachments to change the look of your doll. This means that stores have extra heads for sale on the shelves. Picture it: rows and rows of disembodied Barbie heads smiling out at you from shiny plastic boxes. It's a little weird. I had to get one and try it out. The trouble is, I know so little about Barbies that I bought the wrong thing. 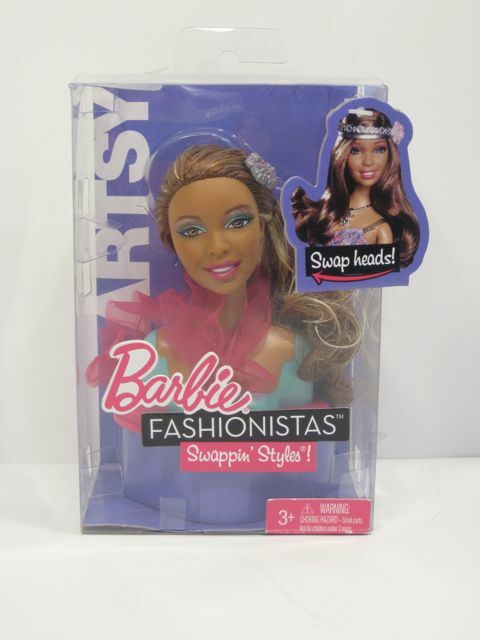 I bought a doll that said "Fashionista" on the box, and I bought a head that matched her skin tone and also said "Fashionista," but when I got everything home and tried to get the doll's head off, it simply would not come off. 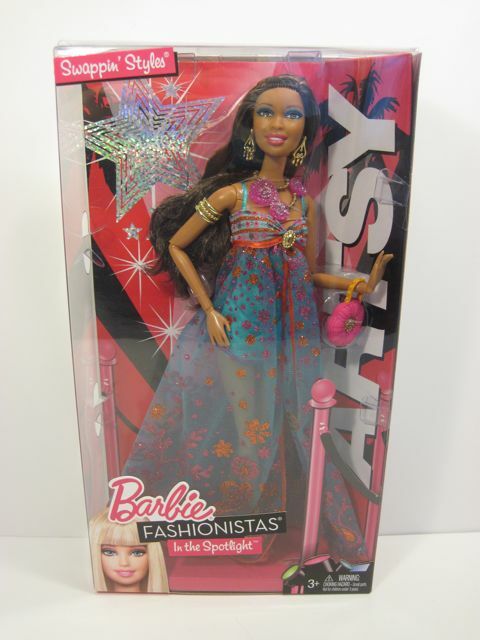 So, the first thing I learned about the Fashionista line is that not all of the dolls have interchangeable heads. Watch out for that. 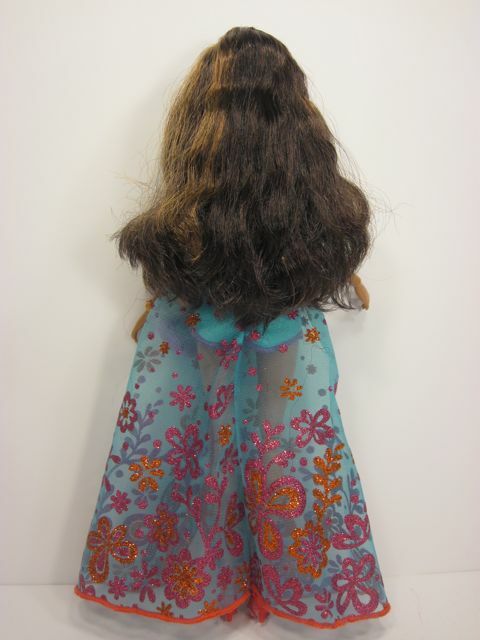 The new Fashionista dolls are wearing gowns that suit their individual personalities. 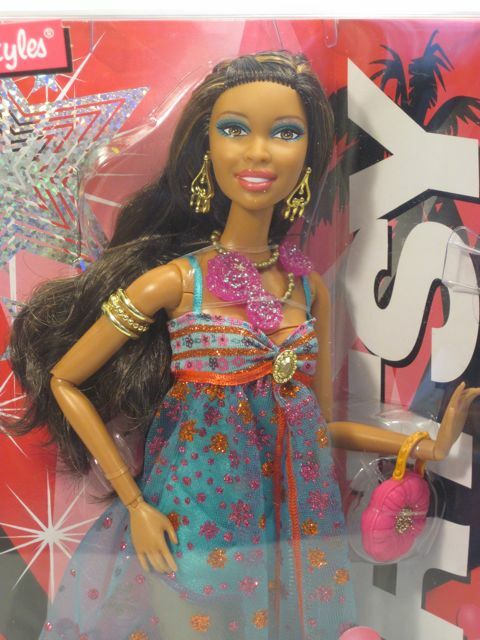 These dolls retail for $18.99 at Toys R Us and $16.99 direct from the Mattel site. "Swap Your Style!" sounds much better than "Swap Heads!" All of the different dolls in this release are shown on the back of the box. Most of them were at the store so I could see them in person. "Artsy" really stands out to me. She's very pretty. I love the colors in her dress, too. This is the same character I chose when I messed up before, so I picked her again. 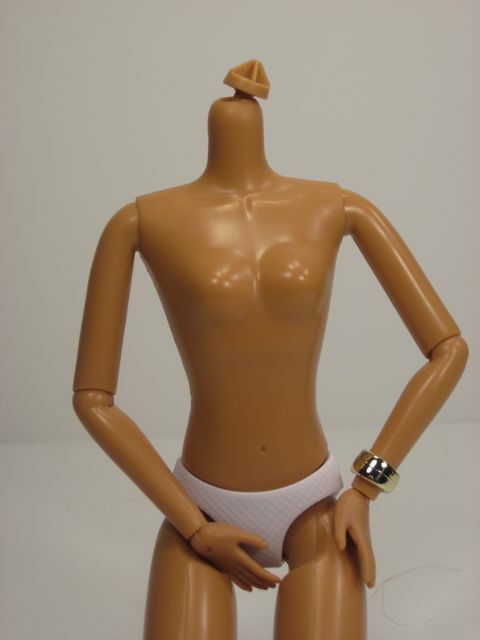 There was only one extra head available for the Artsy doll at Toys R Us when I was there. The heads retail for $4.99. I think there is only one other head that can be purchased for the Artsy character, and it looks very similar to the one I got. You can find it on Amazon. 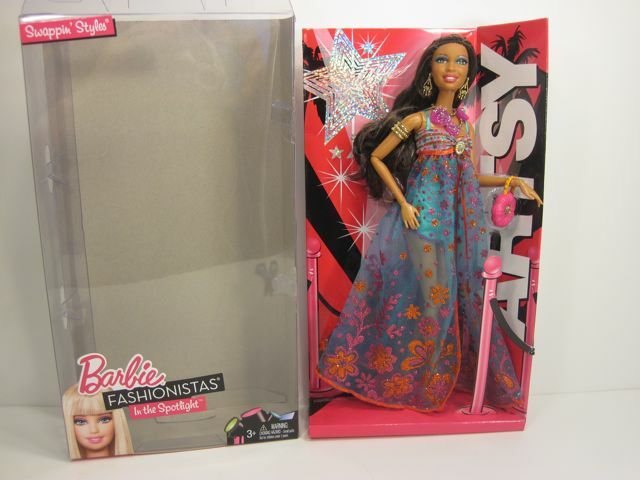 Since I don't really have a Barbie "stash" at my house, I grabbed an extra outfit, too. I don't think this is meant for the Artsy character, but I like the fabric and the glittery shoes. It cost $6.99. She can kneel, but that head isn't going anywhere. It's a nice, simple display. It is appealing, but doesn't have a ton of unnecessary plastic props or extra do-dads. The hair is a big mess. Very hard to manage. All of the accessories on this doll are held in place with those transparent rubber bands. It took a while to locate and remove all of them. The big necklace is to divert attention away from the seams, I think. 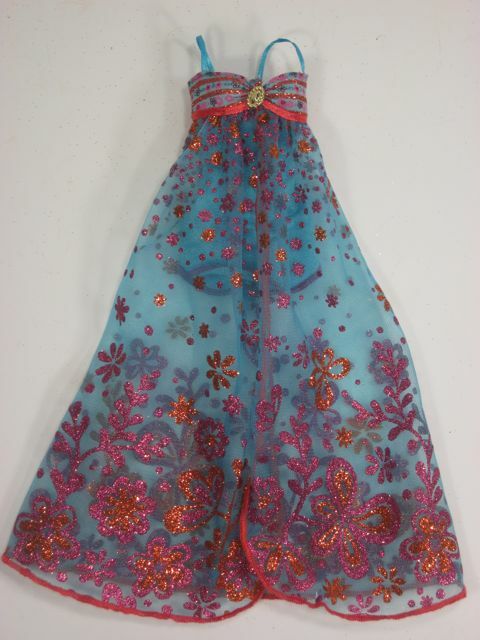 The dress has beautiful colors and lots of glittering floral details. The net fabric of the long skirt is pretty stiff, partly from all of the glitter, but also just because it is a coarse netting. It's a strange dress--it reminds me of a negligee. Underneath the longer skirt, there is a blue nylon (polyester?) mini dress. This is cute, but it is sewn onto the longer skirt in the back, which makes for some awkward bunching and hiking. The shoes are nice (not Monster High nice..but nice). They are really easy to get on and off, which is always such a relief to me. 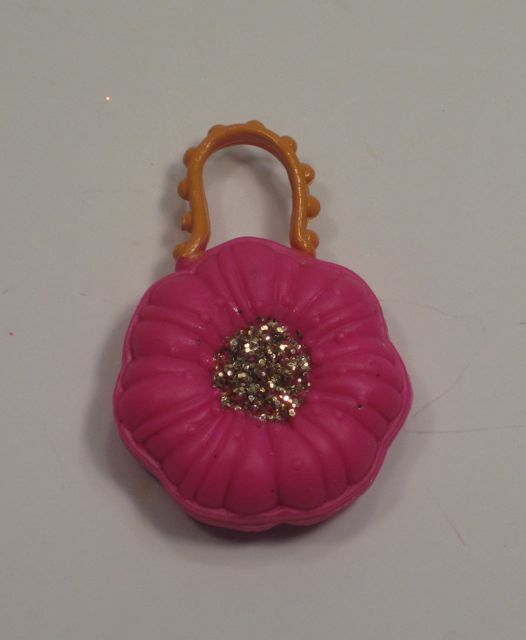 The only extra item she comes with is this solid plastic pink purse with a glittery center. It is not very well done and seems dismissible to me. I like this head so much better than the one that comes on the doll! Directions went over my head, but the tab pulls out easily. The pink tulle item is a scarf. It will work nicely to hide some of the seams form the removable head. The hair feels like greasy straw. It is epically disgusting. The head comes free from that blue stand really easily. There's nothing anchoring it in place once that black tab is gone. 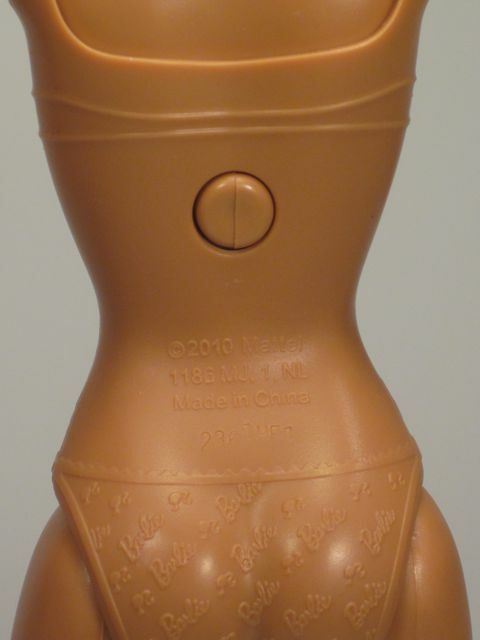 The trick to swapping heads is that there's a release button on the back of the doll's body. You push that button and the old head is ejected. The new head can then be slid onto the body and clicked into place. It truly is as easy as they said it would be. Phew. She's got molded underwear with the Barbie logo on it. Very cute. looks like the top of the bra line. Ugh. That hair! Combing doesn't help much. This doll is actually quite fun and unique. I really wish I had five more heads to try out! 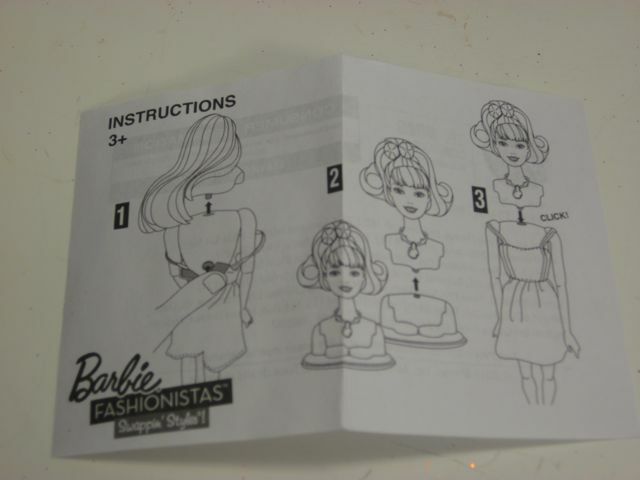 It'd be so fun to have heads with fancy, outrageous hairdos for these dolls. That'd be perfect for Barbie's wedding or the prom, or whatever other special occasion comes up in a child's game. I'd also love to see different hair colors--why not a lovely dark purple shade for Artsy? There could be heads with costume makeup or heads with no makeup and closed eyes for bed time. How about a pensive Barbie expression, or even a sad one? Braces? Freckles? Grab the ball and run with it, Mattel! This could be so cool. 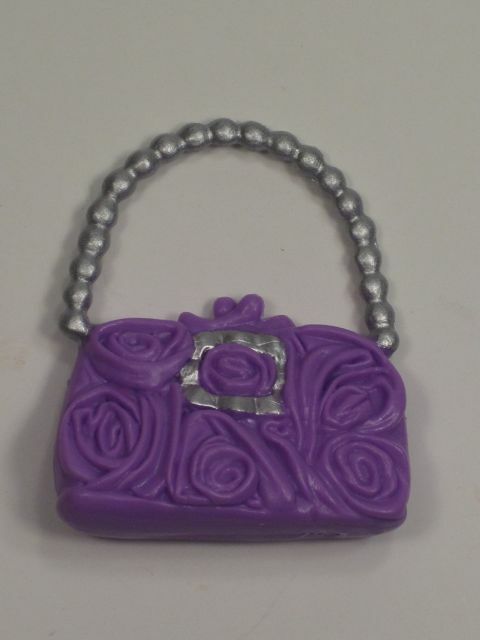 This purse is better than the other one, but still unnecessary, I think. The hair actually looks nice when you let it down. I don't think I am a fan of Barbie hair in general, but at least the underlying cut isn't lopsided or thin or something. They both have rotation in the knees, which is a feature I really like. They can sit without their knees splayed apart. Ok, now I want to try something that was suggested to me in the comment section of a Liv post. Apparently, you can swap Barbie heads onto Liv bodies. This is especially interesting since now you can buy spare Barbie heads for only $4.99. Getting the head off is pretty easy, but I think it would've been better if I had soaked her head in hot water for a few minutes rather than just ripping it off. No, really, I like watching that crack on the ceiling. It's fine. Gotta love the Liv body, though! It seems much more realistically proportioned than the Barbie body. 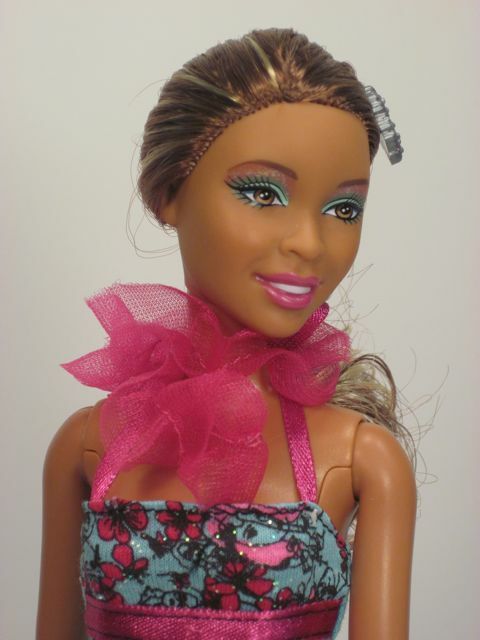 Maybe I was supposed to wrestle that black neck piece off the Barbie body and use it, too? I am hoping one of you will let me know what I did wrong. One other feature I'd like to mention is that Mattel seems to have paid close attention to the color palette of each Fashionista character. 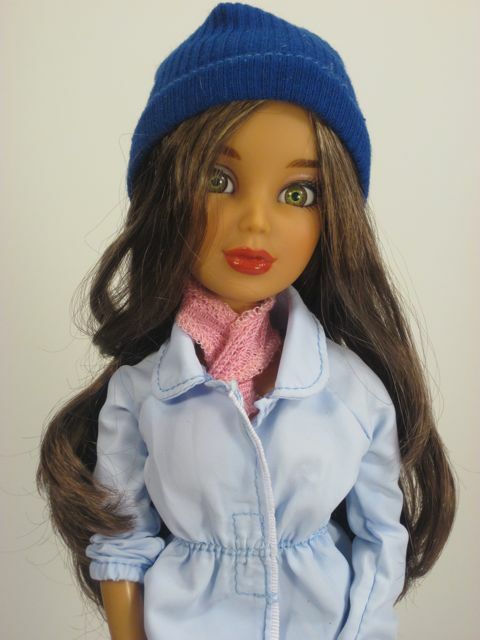 For example, the clothes that come with the Artsy dolls and the clothes that are sold separately for the Artsy character all seem to go together--and coordinate with the makeup of the dolls. This allows for fun mixing and matching! Here are all three Artsy heads for you to compare. I hope Mattel makes more! In another Barbie outfit I had lying around. Wearing the separate Fashionista dress. The extra head with hair let down. Bottom line? Because of the limited head options for the removable head Fashionistas, out of the three dolls I own, I prefer the first wave Artsy. I like her soft makeup and her simple, bohemian outfit. Although her head can't be removed, her body has very nice articulation, especially in the legs and the torso. I was not aware that the articulation was so nice in Barbies these days. Perhaps it is just this line? 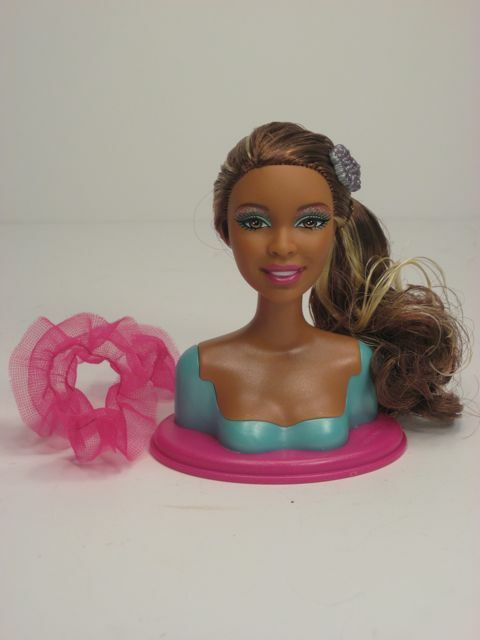 If Mattel releases even two or three more heads for each Fashionista character, my preference would very quickly shift in the direction of the removable head dolls. I think the idea of a switchable head is very clever and has huge potential. If the heads were different enough from each other, or better yet if there were some daring designs like colored hair, fancy hairstyles, different facial expressions or changing eyes, I could see this product becoming at least three times as exciting as it is now. 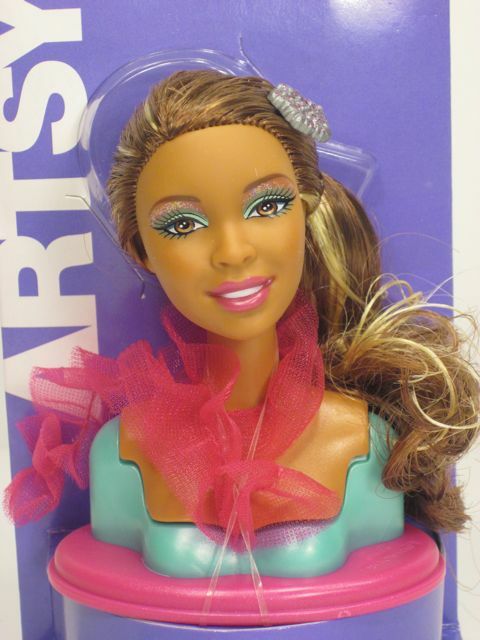 I am drawn in by the possibility that $4.99 could some day really, truly buy a doll a whole new look. I will watch this line with interest. Box says 3 and up, I’d give this to a child who is at least 4. Costs ~ $23 for the doll and an extra head. This is pricey for a Barbie. Good on average. Hair is not of great quality and tangles easily. 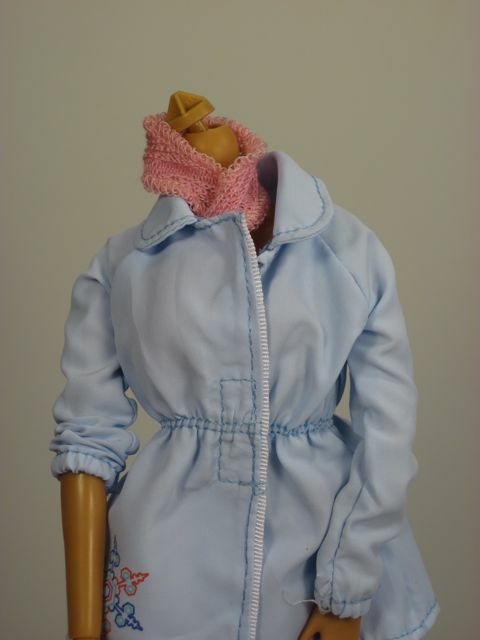 Clothes are made of inexpensive materials, but are nicely designed and have a lot of fun accents. Head switching mechanism is solid and works well. 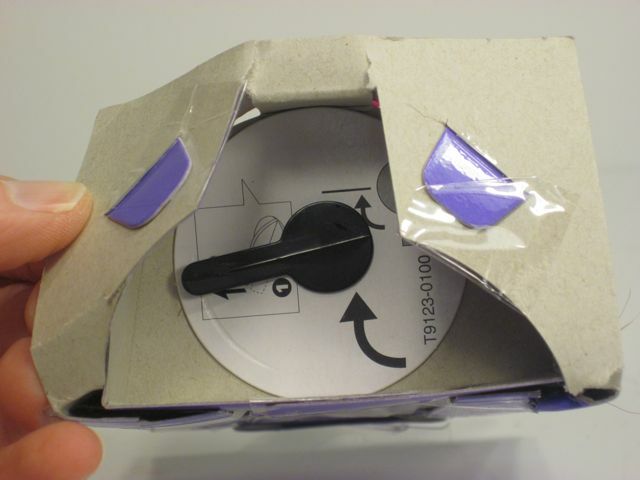 Simple, standard packaging with a fair amount of plastic. 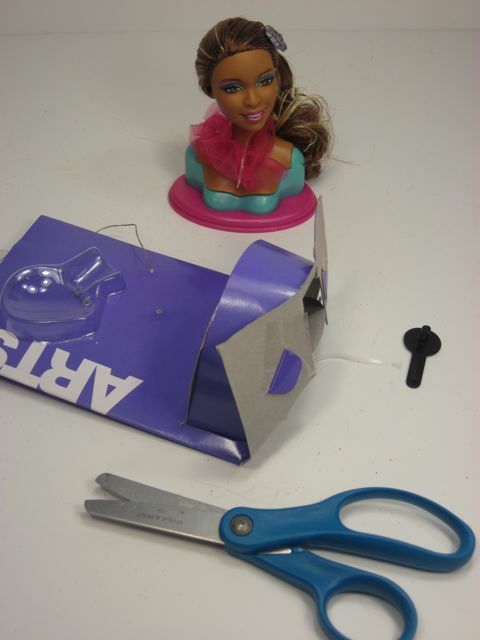 Easy to get doll out without damaging it. No--this is a play doll. If there were more heads on the market, this could become an incredibly versatile toy. 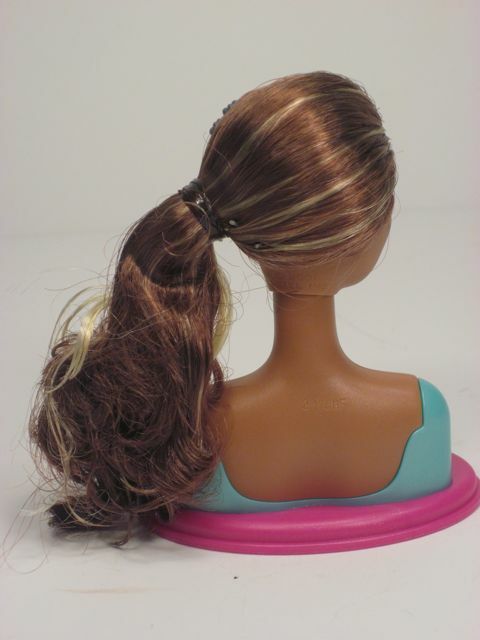 With only two heads to buy separately, the doll has little more to offer than a regular Barbie. But Barbies are pretty versatile. I think this toy has great unrealized potential. I hope Mattel expands this idea rather than canning it. 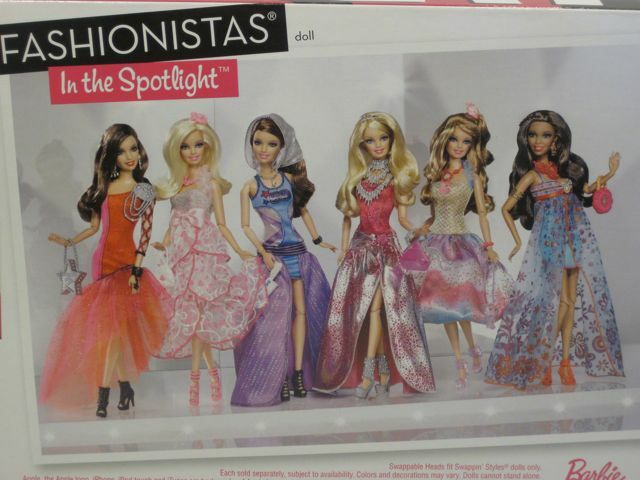 I hate to be a bummer but Mattel has reworked the Fashionistas again and the swapping heads are gone. The good news is there is a new skintone and they have actual names now. Anyways I never cared for the swapping feature much. Oh, no! There was SUCH potential with this idea. I was really having fun thinking of all of the different heads they could make. As they were, the extra heads didn't add much to the dolls, though, so I can see why they're on the way out. There go all of my hopes for a sleeping Barbie...surely she needs a nap now and again? I like the new skin tone news! I also like the naming news because I am already tired of calling her "Artsy" (and I just love names). 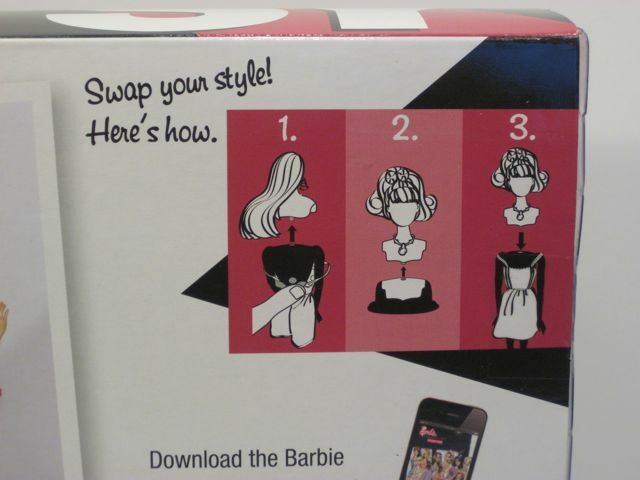 The "swapping styles" thing was actually on some of the MyScene dolls. I don't think the bodies were articulated though. But if you wanted to have more options for an Artsy, you could buy more of the shoulder/head combos and just swap the head part (by ripping it off the little joint and replace it with other heads of the same skintone). 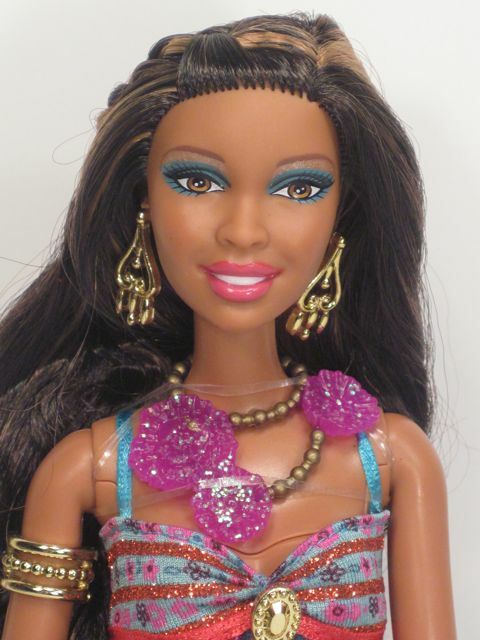 As all of us headswappers know, Artsy's skintone matches a lot of the "ethnic" barbies. Yeah, I need to get better at headswapping! If I could re-paint the heads, too, that would be ideal because then I could add to the diversity of the looks...right now they are all so similar! Yeah, the swapping heads fashionistas are supposedly on their way out, BUT that means you can probably get them cheaper. 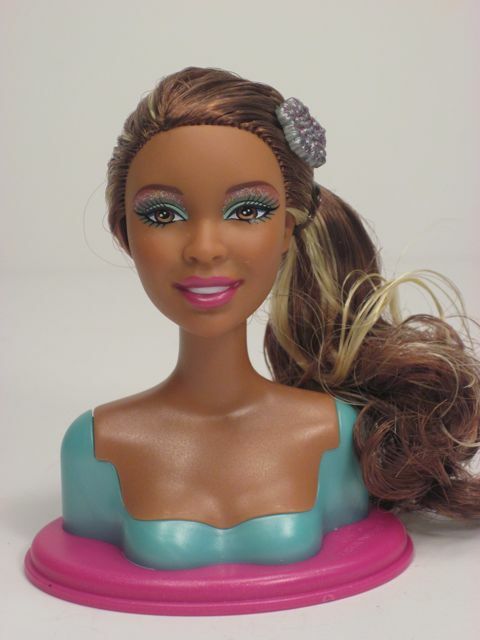 There were only two skin tones for swapping heads barbies, the artsy skintone and the tan skintone. I do wish that when you pushed the button on the back of the doll that he head would kind of "shoot" off. That would be awesome. Wait...a rubber-faced My Scene?? :-O I need that. Freaky or not, I think I need it! I enjoy your blog. That's on my bookmarks now...and now I need a Ken doll, too. It never ends. 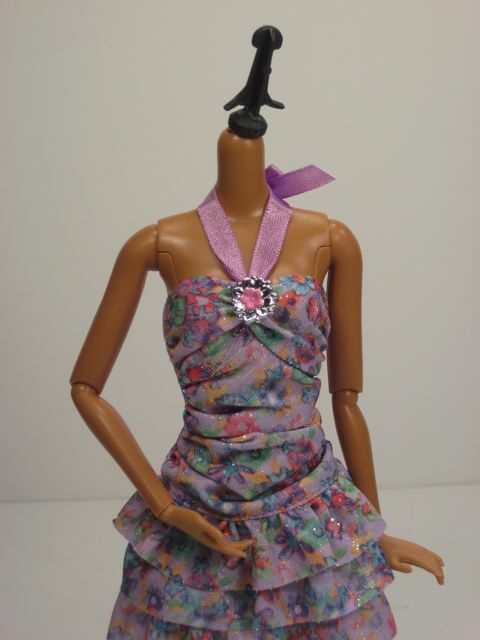 I got one of the swapping head fashionistas a while back, but was a little skeptical of her head switching. After playing around with the head swapping, it's seemed to stay on really well!...Until I brushed her hair. 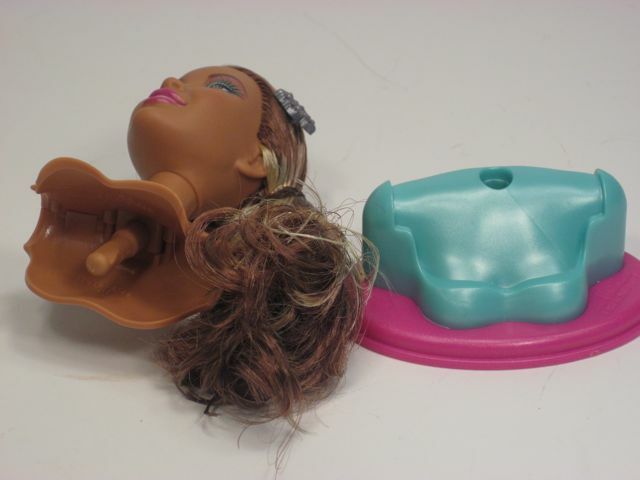 I was brushing along and suddenly...where did my dolls head go?! It was on the floor. So the head stays on pretty well (and are easy to switch), unless I brush her hair. So from now on I just remove the head to brush the hair. You were mean to your dolls when you were a kid! Lol, sorry if I offended you! hola de nuevo, tus blogs son muy buenos, si quieres saber como es una muñeca que no tienes y decidir si la compras o no. veo que tienes problemas con los embalajes y las cajas, y te gusta despeinar las muñecas. son tus muñecas asi que puedes hacerles lo que gustes, en lo personal a menos que sea una muñeca de segunda jamas las despeino, mucho menos se los corto. entiendo que hay muñecas para personalizar y otras que se arruinan si las despeinas. me gusta que les quitas la ropa y muestras los cuerpos de las muñecas. Yo si tuve barbies de niña, han mejorado mucho desde los 80s. las top models no me gustan, demaciado estilizado. mis favoritas son las fashionistas aunque las de segunda como ya estan flojas no se sostienen de pie ni con base. todavia no sé como desmontar las cabezas de las barbies sin que los ganchitos de la cabeza se abran, lo he buscado pero no hay información asi que cuando lo hago escojo una barbie de segunda con cabeza maltratada y cuerpo bueno. corto con una navaja la cabeza por la mitad para no dañar el seguro. Veo que en E. U. hay miles de muñecas que en México no se pueden conseguir. que suerte tienes. Thanks a lot for this review - it has helped me make up my mind about which Barbie to buy.I don't like the fact that the hair isn't good quality. Glad to read that you rebodied a Barbie head onto a Liv body. Neat, isn't it? Oh and I agree with you about the first Artsy face being a favorite. Love the more natural colors. Why buy a barbie with swappable heads when you can just buy multiple whole barbies? Serious question. Hi, I have a question about the body. I've been eyeing to get one of those very poseable dolls, but almost all of them are just so expensive, so I thought of getting the fashionistas, but I heard they have hallow bodies and limbs, is that true?